I have been on enough diet programs in my lifetime to know that weighing every single day, is NOT a good idea. The ups and downs can wreak havoc with our emotions. When I know that I did not make good choices or bailed on my exercise, I hide from Mr. Scale. He becomes nothing more than a dust magnet. When I have been a good girl, I run for Mr. Scale every morning when I wake-up, sometimes several times a day. Weight Watchers and most other programs stress the importance of only weighing once a week, to avoid those tiny bumps that occur during the week. To be honest deep inside my brain, I agree. But that is not stopping me from jumping on Mr. Scale every morning since being banded. When Mr.Scale is nice to me that morning, I fly through my day like I won the lottery. On the other hand, when that evil Mr. Scale goes in the wrong direction, I drag around like I lost my best friend. Why do I do this to myself? I think that I still hope my band will be the magic wand that will change me overnight, even though I know better. Whatever the reason, I need to find a way to become friends with Mr. Scale, so that he can guide me through my new healthy lifestyle instead of being a roadblock. 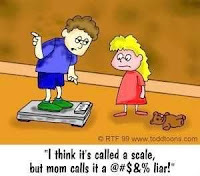 I run and jum on the scale every morning now that I am banded also...I know better than this, but I can't stop myself!! I'm a scale-hopper too...But daily fluctuations don't bother me so much anymore. The thing that I don't like about weighing just once a week is - what if your lowest weight of the week was the day before you weighed and you never even knew it? What if your official "weigh in day" is the day you are retaining 4 lbs of water weight? On one of the many diets I did, I remember they advised weighing daily and doing an average every 3 days. Something like that.